The double-ringed crater on Mercury pictured in the lower left of this image appears to be filled with smooth plains material, perhaps volcanic in nature. The MESSENGER spacecraft took this image during its closest approach to Mercury on Jan. 14, 2008 using its Narrow Angle Camera (NAC) on the Mercury Dual Imaging System (MDIS) instrument. Robin Wylie is a doctoral candidate in volcanology at University College London. He contributed this article to SPACE.com Expert Voices: Op-Ed & Insights. Extra-terrestrial volcanism is every bit as stellar as its sounds. The Earth puts on its fair share of spectacular eruptions — but it's Earth's distant cousins who win the awards. Lava-scarred Venus has more volcanoes than any other planet we know; Olympus Mons, a treble Everest soaring above Mars' Northern Hemisphere, is the largest volcano in the solar system; while Saturn's frozen moon, Enceladus, where cryovolcanoes shoot towering streams of water through a crust of solid ice, must surely rank as the strangest. But what about the one place where you'd expect the ground to melt? Sitting just 36 million miles in front of our star, sun-baked Mercury receives a colossal dose of solar radiation with almost no atmosphere to soften the blast. It's perhaps not surprising, then, that alongside its thick coating of meteor scars, the gray, scorched crust also shows signs of damage from within. Since Mariner 10 first revealed its surface in the 1970s, conspicuously smooth plains — reminiscent of the lunar mare— suggested that in places, the impact craters had once been resurfaced by giant lava flows. When MESSENGER performed its first flyby of Mercury in early 2008, it sent back a hazy image of a feature, from somewhere in the planet's Northern hemisphere, showing what its discoverers called a "kidney-shaped depression." This strange formation was clearly very different from the ubiquitous, uniform impact craters. What's more, it was surrounded by an unusually bright, reflective material, which the satellite's instruments later identified as pyroclastic debris; the scientists were looking at an alien volcano. And, as it transpired, alien in more ways than one. It soon became apparent that the "crater" in the flyby image was actually several — a collection of distinct, individual depressions, rather than the single summit vent typically associated with a volcano. Intriguingly, this formation was strikingly similar to a type of volcano found on Earth, called a compound volcano. 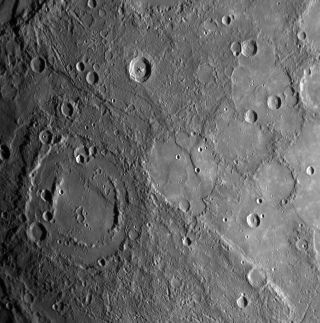 These rare features are caused when the location of volcanic activity "migrates" over time, and their occurrence on Mercury was something completely new. Frustratingly, the images from the flyby were too coarse to allow a more detailed interpretation; but when MESSENGER returned, three frustrating years later, the kidney was back in its sights. In 2011, now in full orbit, the stabilizing influence of Mercury's gravity allowed the satellite to map its target in unprecedented detail; and with this boost in clarity, the enigmatic volcano quite literally took on new dimensions. Several new craters, invisible during the flyby, emerged on the sharpened images — the volcano lost its organic resemblance, and grew by 30 percent. With this increased resolution, even more subtle features rose into view. While the floors of the volcanic depressions had previously appeared smooth, they were now found to contain tiny impact craters. And it was this find which gave planetary geologists the chance to do something incredible. Most of Earth's ancient scars have been erased by erosion or subduction of the planet's crust. But with no plate tectonics to recycle Mercury's crust, its meagre atmosphere, and not even wind to reshape its surface, the countless meteors which have etched themselves into the planet's landscape over time remain there as an ancient record — one which is particularly useful for scientists. The density of impact craters in a given area can be used to estimate its age; roughly speaking, the more meteors which have hit, the older it is. Interestingly, this 'crater-age' can also be used to reconstruct ancient volcanic activity. The density of impact craters within a volcanic crater can be related to the timing of its last eruption — that is, the last time it was 'resurfaced' by ash or lava. And in freshly published research, a team of researchers from the UK and France — writing in the journal Earth and Planetary Science Letters — have applied this technique to the volcano found by MESSENGER, to estimate when its various craters were active. A terrestrial volcano which endures for a million years is considered ancient. But here, next to the sun, was a single volcanic structure which had conceivably remained active for as long as there has been complex life on our planet. There are volcanoes on the Tharsis plateau on Mars that may have been active over similarly huge timescales; and it will take much more interpretation — perhaps even repeat visits — before Mercury is awarded a record of its own. But this incredible view of Earth's still-mysterious neighbor has raised an enticing question: Have scientists just found the longest-lived volcano in our solar system? Editor's Note: This story was updated on Dec. 8 to correctly reflect that Olympus Mons on Mars is the largest volcano in the solar system, but not active. The author's most recent Op-Ed was "Volcano Detectives Uncover Monster Ancient Eruption." The views expressed are those of the author and do not necessarily reflect the views of the publisher. This version of the article was originally published on SPACE.com.